The Edge Harbourfront Lofts. 55 Gore Ave. is a huge 1,710 sq.ft. double height ground floor loft with access from Gore Ave. as well as from the double doors opening into the inner courtyard area. 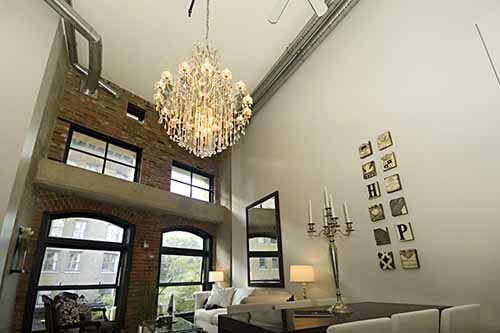 This loft has 19 foot ceilings a 75 foot concrete feature wall and a large 27' x 17' workspace. This is a very unique space for the discerning loft buyer. There are two parking stalls outside your courtyard door. The Edge has a 7,000 sq. ft. amenity building which has wood, metal and ceramic shops, a kiln room, music rehearsal space, darkroom, exercise room and a large multi-purpose room. Pets are okay with 2 dogs or 2 cats or one of each and rentals are allowed. Great central location close to everything Gastown has to offer. Open House Sunday June 12th, 2-4 pm.